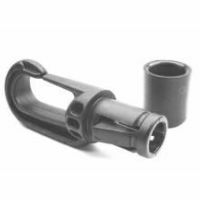 Bungee and shock cord self-assembly plastic bungee cord hook ends. These strong black nylon hooks offer you a very clever self-locking collar to make up your own bungee luggage straps, tie-downs and all manner of fittings made to the exact length that you require. The all-plastic design offers a corrosion free assembly that is ideal for outside use. Available for 6mm and 8mm bungee shock cord.